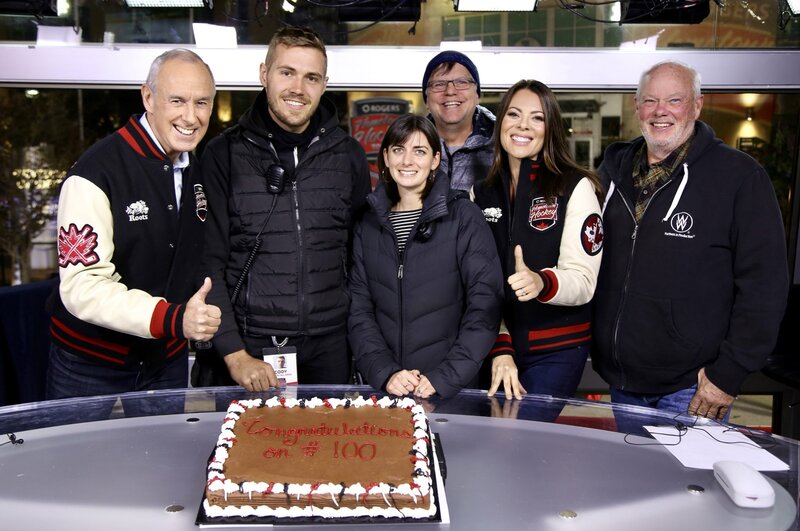 The Puck Drops for the 100th Time as Rogers Hometown Hockey Partners with Whites Toronto’s Generators and Travelling Transport | William F. White International Inc. Whites Toronto has been partnering with SDI Marketing to provide Rogers Hometown Hockey with the necessary load-sharing generator power and support to run this celebrated cross-country event since its inception in 2014. This year’s festival kicked off in Kitchener, Ontario on October 7th, but the most impressive milestone happened this past weekend in London, Ontario, when the travelling hockey tour made its 100th stop! Hockey Hall of Famer, Eric Lindros even dropped by to show his support and greet some of his adoring fans. Our thanks and admiration go out to Master Technician/Driver, Bob Rodgers, (pictured above displaying our logo proudly on the far right) alongside famed hockey commentator, Ron MacLean. Hometown Hockey will continue its tour until making its final stop on March 31st in Saskatoon, Saskatchewan.